A razor-beaked icon of the Utah bird conservation movement turns 58. “I want people to love birds as much as I do, so they care enough to make efforts to conserve,” Helen Dishaw says. 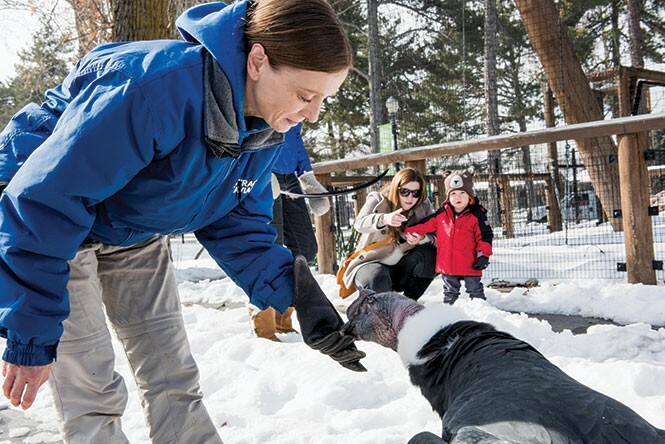 Shortly after Helen Dishaw was hired by Salt Lake City's Tracy Aviary as curator of bird training and education in early 2011, she asked her boss if she could take Andy, the then-52-year-old Andean condor out of his exhibit. In June 2011, on Dishaw's birthday, she took Andy for his first walk around the 9-acre property. The deeply curious bird, whose natural habitat is South America, walked up to a tree and scrutinized it. At first Dishaw wondered what he was doing, and then it dawned on her: The 29-pound, fully flighted vulture "had never seen a tree before. Those were very emotional moments." When he went up to a stand of tulips, she was worried the unusually laid-back carrion eater would damage them with his razor-edged beak. "He touched every one of them with his beak, didn't damage a one," the 45-year-old says in her Northern English dialect. In the six years she's worked with him, she says he's never bitten anyone. Since that first stroll, Dishaw has accompanied Andy Mondays through Fridays and on holidays along the aviary's pathways for an hour at a time. The experience, she says, struck her early on as what it must feel like to have a child. She calls him with treats—quail liver, beef heart slices—which she gives him from a thick-gloved hand. Tracy Aviary is the only place in the United States where you can walk with a condor. He is its pied piper. Aviary visitors follow him around in small crowds. Children and adults alike are fascinated by his graceful, lolloping pace, his quizzical gaze and the 9.5-foot wingspan which he occasionally unfolds. Aviaries seek to educate people about caring for exotic birds and thus create more support and interest in the protection of such birds and their habitats. At first, the aviary used Andy as a marketing tool, offering a stroll with him as a raffle prize for VIPs. But as Dishaw won the bird's trust, her work with him led to the bird providing not only an intimate, moving encounter with an icon of the South American wild for all ages, but also an ever more powerful tool for conservation. Whoever would have thought, Dishaw says, she'd have a BFF who's a condor? "He's like the love of my life," she says. "If something happened to him, I don't know what I'd do." Condors, she rhapsodizes, are beautiful creatures. They are monogamous, dedicated parents and help the environment by devouring dead animals. "We should all be so virtuous, right?" She calls Andy "the quintessential ambassador for his species." Grandparents bring their grandchildren to see a bird they themselves grew up with. "That sense of history here is humbling. He's been inspiring people longer than we've been alive." So, on March 4 at 11 a.m., the aviary will host a birthday party for 58-year-old Andy. Dishaw works with 36 birds at the aviary, running shows where they free-fly before audiences. She says she hasn't lost one yet. "You treat birds the way you'd want to be treated yourself. You make sure everything you do is positive; otherwise, they'll go. They can chose to fly away." A recent theory, she explains, is that birds respond best when they have control. "They don't have all the freedom of wild birds, but they don't have all the drawbacks, either," of shrinking habitats, poisonous environments and predators. Andy was hatched at San Diego Zoo as part of a joint-condor breeding program with Los Angeles Zoo and hand-reared as a chick. At a year old, the zoo sent Andy to Utah in 1960, where he has remained ever since. Now, birds hatched in such programs are reared through puppets and blinds so they don't have a "human imprint," Dishaw says, and can be released into the wild without any human connection. That visitors to Zion National Park can see California condors in the sky is in part thanks to pioneers such as Andy. By the late 1980s, there were only 22 California condors—their ranks having been decimated by pollution, hunting and lead poisoning. A breeding program at the San Diego and L.A. zoos that drew on lessons learned from the condor-breeding program that Andy came from, eventually saw the numbers of California condors bounce back to currently under 500—half of them released into the wild. In 2014, the first condor chick was hatched in Zion National Park. "It's safe to say, without the Andean condor, there wouldn't be California condors," Tracy Executive Director Tim Brown says. When Brown joined the aviary 13 years ago, the condor lived in what he recalls as "an old monkey cage that had been converted for him." But moving Andy from the industrial-looking, black chain-link enclosure with its own cave to a new exhibit on the northwest corner of the aviary proved challenging. That cave was all he had known, so to get him to move into the new exhibit with a door that opens into a cave, Dishaw had to sit inside the door with treats of animal offal, until he started feeling comfortable there. The condor is far from Dishaw's only responsibility. Brown says she works "magic" with many other birds, citing a hornbill called Zazu that the San Diego Zoo had struggled with. Under Dishaw's care, Zazu evolved into a key part of Tracy's show, flying off into a tree when she releases him, then returning at her bidding. "Back in the day, we used to chase birds all over the place," Brown says. "Come on down, dude," Dishaw calls out on a snowy Tuesday morning in January. The condor hops down several steps from his perch, then ambles out to greet her. His bald head and white-feather encased neck are reminders that vulture diet is mainly carrion. They rip open carcasses for the organ meat inside, their bald heads allowing the entrails to fall away. "We joke it's like jelly donuts—all the good stuff is in the middle," the handler says. The white ruff of feathers acts as a hoodie for the bird in the cold. Andy's curiosity in human spectators is apparent as he approaches a reporter dawdling behind him to briefly investigate before trotting off at Dishaw's call of, "And, come here." Just how rewarding human interactions are for the bird is a matter of speculation. "We as humans get much more out of it," Brown says. He believes Andy's quality of life has improved, thanks both to the exhibit, titled "King of the Andes," and his abiding connection with Dishaw. Andy has close to 8,500 followers on Facebook; the passion for the bird thrills Dishaw. "He's a vulture, the most vilified and persecuted of species," she says, and yet he captivates all who encounter him. Andy purposefully heads over to the golden eagle enclosure, despite several calls from Dishaw to come to heel. The two eagles, Dishaw says, are "his arch nemeses." Andy stands in front of the enclosure, the golden eagles haughtily glaring at him from their perches. Dishaw says that for all the information the aviary shares with its visitors, the true value from a conservation perspective of people interacting with a bird like Andy is the emotional connection. She recalls a family whose 2-year-old called the bird by name and identified him as a, she recalls in her Geordie accent, "And-e-an condor." It's that immediacy that she strives for. "I want to see people have a visceral reaction to birds—that's what changes behavior. Andy is the king of that. People fall in love with him, he gets right into their hearts."